Tokyo, Japan, July 25, 2013 –The Teijin Group announced today that Toho Tenax Co., Ltd., the core company of the group’s carbon fibers and composites business, and GH Craft Ltd., also a member of the Teijin Group, have supported Japan’s Kogakuin University in developing a car made with carbon fiber reinforced plastic (CFRP) for the World Solar Challenge, the world’s biggest solar car race, which will take place in Australia from October 6 to 13. The Teijin Group supplied ultra-lightweight fabric made with Tenax carbon fiber, which was used to design and fabricate the CFRP car body. 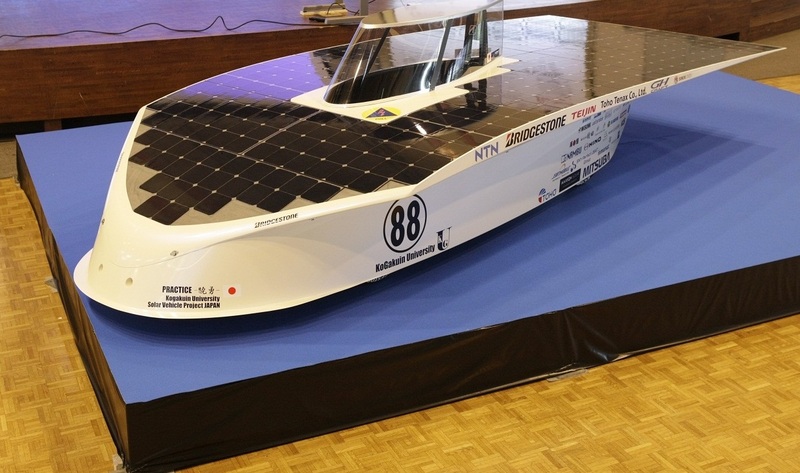 GH Craft has been involved from the concept design stage to develop the innovative solar car’s all-carbon composite body. Toho Tenax, together with Sakai Ovex Co., Ltd., developed in 2010 an ultra-lightweight carbon fiber fabric measuring just 0.06 mm in thickness. The CFRP produced with this material has made it possible to fabricate an ultra-lightweight car body with the stiffness and strength needed to withstand race conditions while reducing bodyweight to an absolute minimum. GH Craft, founded in 1972, is engaged in all stages of composite structure fabrication, including design, molding and structural evaluation, for ultra-lightweight vehicles. It is a leader in developing CFRP composite structures for the automotive, rail and aerospace industries.In addition to thermoset CFRP developed by Toho Tenax and GH Craft, the Teijin Group is also researching and developing thermoplastic CFRP at its Teijin Composites Innovation Center. Such efforts are among other ways that the Group is utilizing its all-round capabilities to develop advanced CFRP solutions and become a leader of the global industry for carbon fiber and composites.